Wow what a night it was! Toastmaster Ade skilfully took the reins from the absent Dave, and steered a full evening of speeches through many twists and turns. Let’s get in to it! 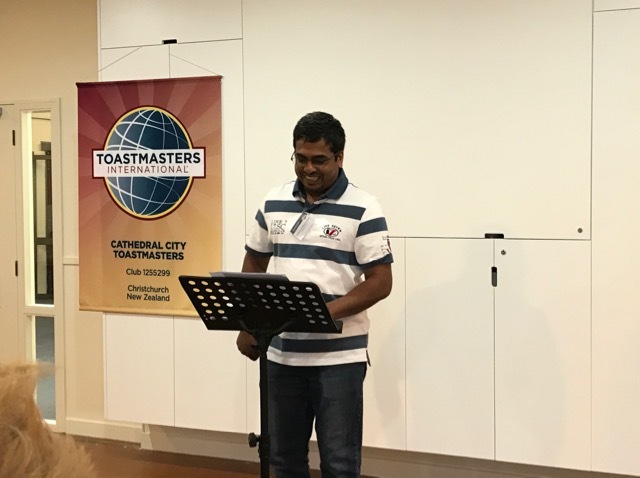 First up was one of our newest members, Ragu, who delivered his ice-breaker speech. Ragu spoke about his native Pakistan and how he came to be in New Zealand. He admitted to still being homesick though, which is completely understandable. We look forward to Ragu getting stuck in to the Competent Communicator manual! Our next speaker was Bryce, who was completing the 6th and final project of his speech craft course. Bryce intrigued us all by bringing in two rather heavy kettlebells. 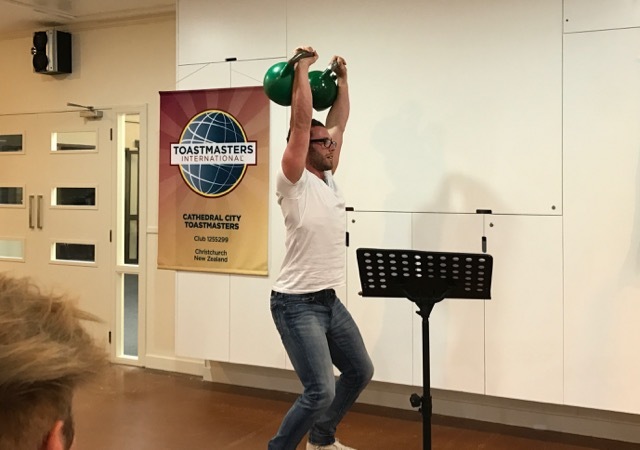 His speech was all about the sport of kettlebell lifting and he even demonstrated many of the moves while talking! It’s fair to say that many of us feared for our safety as Bryce swung the kettlebells around, but no harm came to person or property. Well done, Bryce! 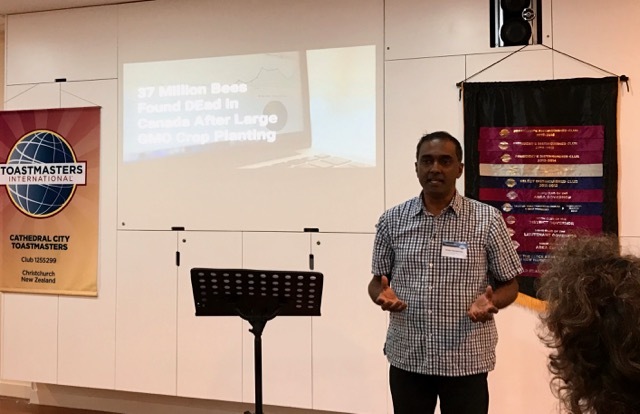 The third speaker was Sergie, who gave an eye-opening presentation about the disappearance of bees all around the world. Sergie outlined the causes of this devastation, as well as the likely outcomes if the bees die out completely. It was a sobering talk, and Sergie urged us all to donate to a research scientist who is looking for a solution. 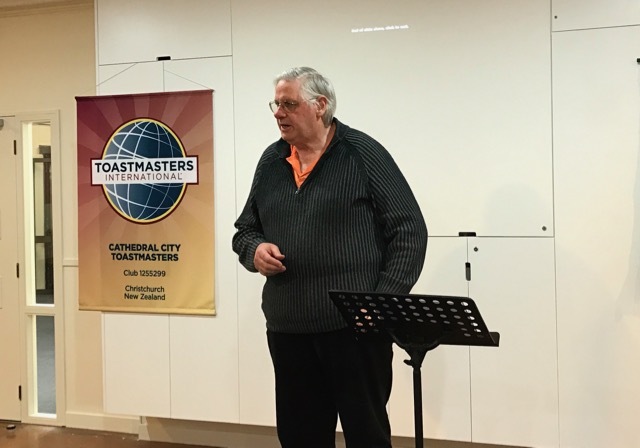 The final speaker was Dave Young, who spoke about the upcoming changes to the way Toastmasters members will progress in the organisation. He outlined when the new Pathways programme would likely be starting here in New Zealand, and explained why it was such a big deal. Table topics were handled by Gary, who presented a simple premise: members who were invited to the stage had to sell themselves into a particular profession, chosen by Gary of course. It was interesting to see everyone use a different method of attacking this challenge. Some participants were even hired on the spot! After the supper break we had evaluations from Kahu, Jane, Dianne, Jan, Pooja, and Matt. The timer for the evening was Hannah. See you all next week!